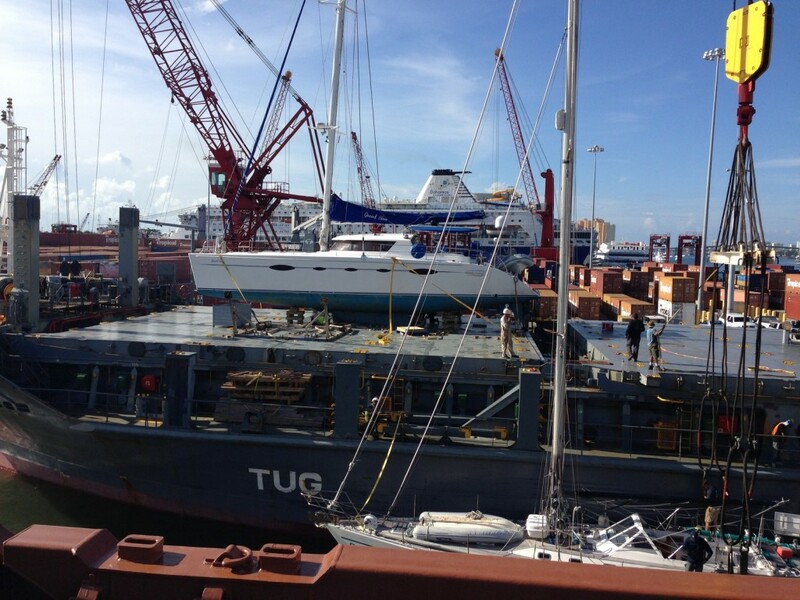 Another international yacht sale on a 60' yacht : Atlantic Yacht & Ship, Inc.
Word just came in from Brent that over the past weekend the 60′ sailing catamaran has been loaded onto a ship and departed for her new owner in Japan. This deal all started a few months ago when we were contacted by a client in Japan. He was specifically looking for a pre-owned 60′ Fountaine Pajot sailing catamaran which is known as the Eleuthera model. Hunting one of these down proved difficult because there are not many currently for sale and it came down to three possibilities: two in Europe and one in Sint Maarten. After some negotiating, it became clear that the best option was the boat down in the Caribbean and once a deal was struck, Brent went down to meet the buyers in St. Martin for the suvey and sea trial. Luckily, the boat was in great shape, surveyed well, and the deal was closed. But now the problem was getting the boat 1,100 nautical miles north to ship out of Palm Beach with hurricane season around the corner! Having lots of experience with shipping yachts around the world, AYS reached out to several reliable shipping agents to find out the best way to ship this yacht to her new home: Yokohama, Japan. Now that the buyer owned the yacht he wanted to get it to Japan as soon as possible to be able to use her before the end of this summer season. After some research, the best and quickest route was to ship out of Palm Beach, Florida but we had less than a week and a half to get there from the islands. Thankfully, the weather was on our side and we were able to have the yacht safely loaded onto the ship this past weekend. She will be in Japan by the end of August for some sailing adventures with her new owner. Are you looking for a firm that specializes in facilitating international yacht deals? Call us today! For over 53 years Atlantic Yacht & Ship has been serving the yachting community. Our headquarter sales office is dockside at Harbour Towne Marina in the heart of the yachting capital of the world, Fort Lauderdale, FL. Our in-house waterside service department provides general yacht services from new teak, to engine rebuilds, captain services, and everything in between. Whether purchasing or marketing a quality vessel, Atlantic Yacht and Ship, Inc. is your one stop resource for the highest quality service and sales in the yachting industry today. If you are looking at yachts for sale, or thinking about selling your yacht, it is always wise to have an experienced broker representing your interests throughout the deal. Contact Atlantic Yacht & Ship at 954.921.1500 or click here.